RunBot* is a biomechatronic design. 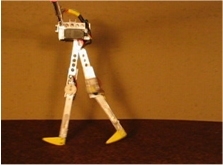 It has achieved a relative walking speed of 3.5 leg-lengths per second, which is tremendously faster than the current world record of biped walking robots, 1.5 leg-lengths per second, and is even comparable to the fastest relative speed of human walking. 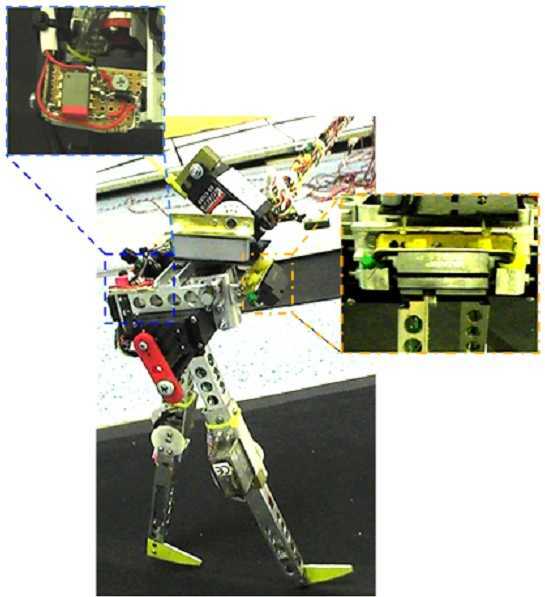 Unlike other biped robots using various model-based controllers, RunBot's mechanical structure (Biomechanical level) is directly driven by motor-neurons of its reflexive neuronal controller (Spinal reflex level), which is analogous to what happens in human and animals' walking. In addition, we simulate a mechanism for synaptic plasticity (Postural reflex level) which allows RunBot to autonomously learn to adapt its locomotion to different terrains, e.g. level floor versus up or down a ramp. As a result, the structural coupling of all these levels generates adaptive, fast dynamic walking of RunBot. 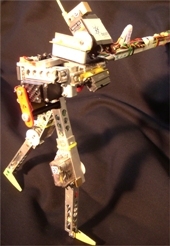 The RunBot architecture has been designed in general following the classical subsumption architecture.We divide our robot system into three levels (Biomechanical, Spinal Reflex, and Postural Reflex Levels) where they are organized as a hierarchicalstructure and coupled via the environment. The walker requires an appropriate biomechanical design, which may use some principles of passive walkers to assure stability. In addition, the active upper body component is implemented on the top of its hip joints for balance in walking on different terrains, e.g. up and down slopes. The active body has the total weight of 50 g. The active component is controlled by an accelerometer sensor implemented beside one hip joint. 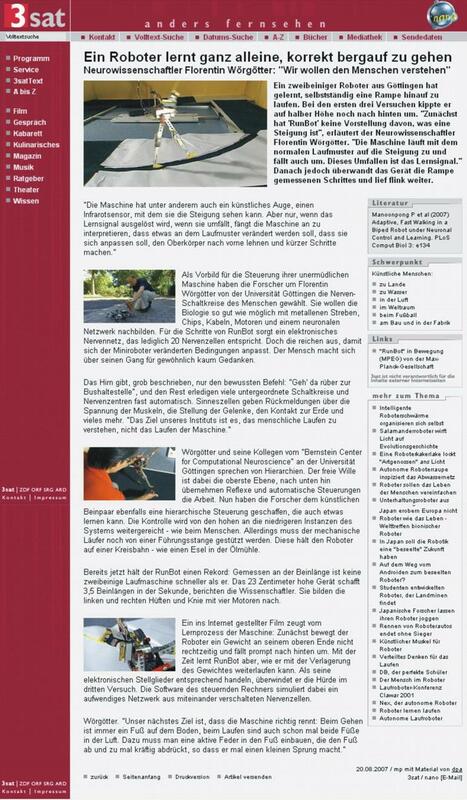 In order to effectively perform adaptive walking on different terrains, one infrared-based vision sensor is also installed at the hip joints and it points down forwards to detect the slope. The sensor signal serves as predictive signal in the adaptive control level. Runbot is constrained sagitally by a boom of one meter length. It is attached to the boom via a freely-rotating joint in the x axis while the boom is attached to the central column with freely-rotating joints in the y and z axes. Thus, the motions of Runbot are only constrained on a circular path. This set-up has no influence on dynamics of Runbot in the sagittal plane. Runbot needs a low-level neuronal structure (Reflexive Neuronal Controller), which creates dynamically stable gaits with some degree of self-stabilization to assure basic robustness. The reflexive neuronal controller of RunBot is composed of two neuronal modules: one is for leg control and the other for body control. The leg control consists of three local loops. Joint control (Spinal1) arises from sensors (S) at each joint measuring the joint angle and influencing its target motor neuron. Inter-joint control (Spinal2) is achieved from sensors (A) measuring anterior extreme angle at the hip. Leg control (Spinal3) comes from ground contact sensor (G) influencing the motor neurons (N) in a mutually antagonistic way. The body control (UBC) represents a long-loop reflex (Postural1) and its sensor (AS) is also involved in controlling plasticity within the whole network. 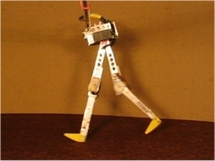 RunBot requires higher levels of neuronal control (adaptive neuronal controller), which can learn using peripheral sensing to assure flexibility of the walker in different terrains. The adaptive neuronal controller is composed of six learner neurons (L1,2,...,6) which converge onto target neurons at the reflexive networks in the spinal reflex level changing their activation parameters. In our learning algorithm, the modification of all those parameters will be controlled by two kinds of input signals: one is an early input (called predictive signal (IR)) and the other is a later input (called reflex signal (AS)). 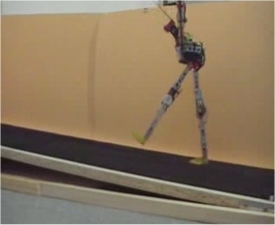 This adaptive control will finally enable RunBot to learn to walk up a ramp and then continue again on a level floor. In this video, RunBot started from a slow gait. A real-time reinforcement learning algorithm is used to tune the neuron parameters online while RunBot is walking. At the end of the video, RunBot attained its fastest walking speed. 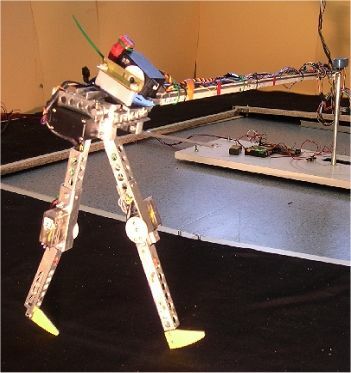 Comparison of the Walking Speed of various biped robots whose sizes, they are quite different from each other, we use the relative speed, speed divided by the leg-length. The figure below shows the relative speed of some typical planar biped robots, RunBot, and human. The dynamic walking capability of Runbot on different terrains, e.g. level floor, up and down slopes up between 0 and 8 degrees. RunBot learns to walk up slope. As a result, it can learn to adapt its walking gait together with leaning the body.